I always get a kick out of it when I go to a doctor and she asks me if I get hot flashes. Hello!! It's over 100 degrees outside. Who in the heck could tell if they were having a hot flash in this temperature!! Anyway, it shouldn't be news to anyone that it's unbearbly hot outside. And yet, the heat is BIG news. Newspapers and news site around the globe (not just the U.S.) are talking about the heat in D.C. This article on Forbes blog entitled Mr. Heat Comes to Washington seems to sum it up the best. No matter how hot it is across the rest of the country, "Any weather anomaly in our nation’s capital acquires cosmic significance." It's a good article with all sorts of interesting facts about heat records in the country, including tidbits about a scorcher in the 1930's that caused things like : "30 rattlesnakes ravaged a farm in Michigan, attacking turkeys for their blood." I did learn a few things from these various articles, though, about how heat affects us, our gardens and the planet. First, I read a post the other day about how 76-year-old Loretta Lynn had to be taken to the hospital for heat exhaustion because she was gardening in 100 degree heat. Loretta's quote was: "There ain't a tomato worth it." It reminded me of my mom, who used to garden well into her 80's. And it also reminded me of the importance of NOT overdoing it outside in this heat. I also learned something new from an article called The Heat Dome Continues on NBC Washington. The article states that the heat combined with the air quality in the area, is making the air unhealthy to breathe, which can be made worse by applying lawn chemicals or lawn mowing. Although I can't imagine ANYONE trying to mow their lawn in this heat, there may be some people who might think applying lawn chemicals is a fairly non-strenuous garden activity. Along with the heat and humidity, the region also has to deal with poor air quality. The breeze helped out Thursday, but it will not hang around for Friday, meteorologist Chuck Bell reported. A Code Red air quality alert will be in effect Friday. Everyone should limit strenuous outdoor activity because the air is unhealthy to breathe. Turn off as many lights and appliances as possible, don't drive if you don't have to, do not apply chemicals to your lawn or garden, and avoid mowing. The heat can affect lawn chemicals in other ways, too. A document on the Virginia Cooperative Extension website says that: "Temperature extremes can cause physical or chemical changes to pesticide products. Such changes may make the product ineffective and/or cause plant injury. Heat makes chemicals more volatile and unstable." 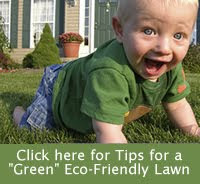 Just more good reasons to ditch the lawn chemicals and go green in your garden. The only other new thing I learned from my heat-reading this morning was that potted plants and raised beds get hotter than plants in the ground. I found that info on the Virginia Cooperative Extension site. That sounds like something I should have already known but just in case you didn't know it either, I'll pass it on. Maybe the heat is affecting your brain the same way it is affecting mine! More info: How to properly dispose of lawn chemicals. Good one, Betsy! A reminder of the dangers of yard chemicals!